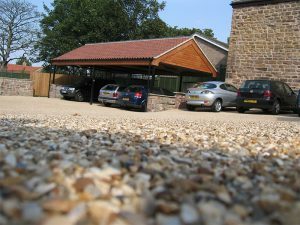 The appearance of the areas outside of your home are just as important as the interior design of the home itself, and that’s why at Resin Mixed Stone we offer a superb domestic surfacing service that caters for properties of all sizes, whether you need work for your driveways or pathways. For those aesthetic touches, or if your driveway has become worn and damaged, resin bound stone surfacing and resin bonded surfacing are perfect materials for any job. Our experienced, highly skilled team can lay your new resin bound top layer efficiently and professionally, ensuring a quick turnaround and the finest possible results. If you would like to know more about our domestic surfacing services, get in touch with us today. We are always happy to help you with anything you need. This client wanted a porous good looking, hardwearing resin mixed stone surfacing with the unusual feature of under floor heating. We laid heating cables with an ice detector within the surface. The owner was very impressed with the finished work, shovelling snow for him is a thing of the past! A housing development built entirely of natural stone required its access road and driveways to be finished in a natural stone, Stonetop Resin Bonded Stone was laid to further enhance the development. When Mr and Mrs Bland from Chapeltown near Sheffield were looking for something special for their driveway surface, they approached us to discuss what they were looking for. We agreed upon a blend of four different shades of natural stone to give a unique finish to give their lovely bungalow a special look. 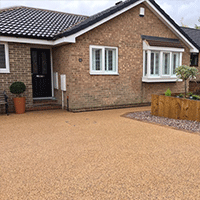 They are highly delighted with the overall look and warm natural feel of the surface and said ‘you can tell anybody who is considering a resin bound finish to come and see our drive, we will recommend you every time. When this garden was upgraded the owner chose to have his footpaths finished in Stoneblend Resin Mixed Stone to give a superb aesthetic finish. This magnificent Manor house was transformed by the resin bonded stone surfacing to the forecourt and driveway.